When I saw theses pots for the first time, I thought the bonsai potter, Hidemi (Shuuhou), made it just as a joke. 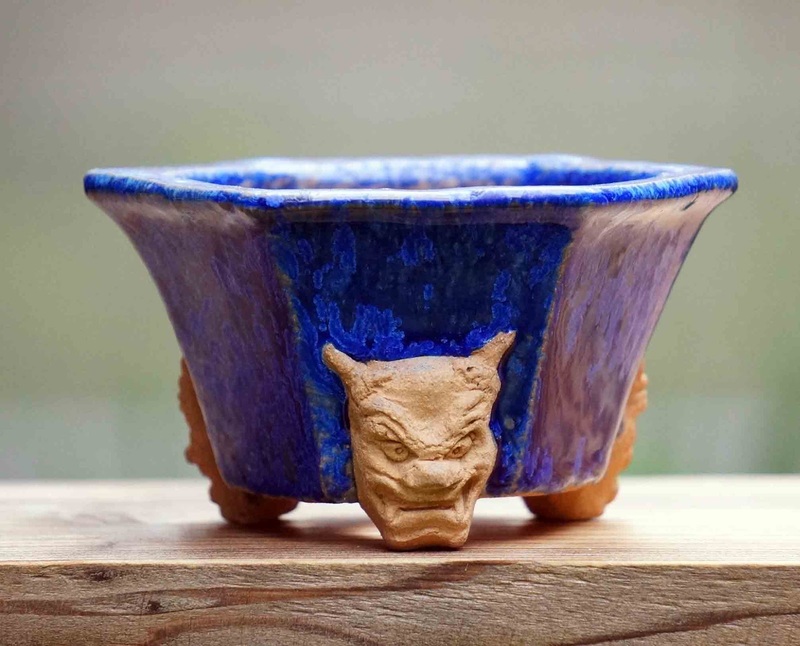 As far as I know, he thinks a great deal of the beauty of the harmony with plants when he makes bonsai pots, however, his new work, the demon face feet bonsai pot, has strong power from the design itself. I think it might be tough to suitably match such a pot with plants. He said an idea flashed across his mind when he was trying to make new shape feet for the pot. Though he has made some type of feet for pots with animal face designs like an owl or a pig, he thought they were too adorable for bonsai pots. ●Demon faces will prevent evil from harming plants!? The demon, called “Oni” in Japanese, is presumed something wicked, but actually has been seen as a symbol of keeping out of harm’s way. You will see an Oni face on a decorative ridge-end tile in Japan. Hidemi said that he made the demon face referring to a picture of the decorative ridge-end tile, so the demon face pot will prevent something evil like harmful insects or illnesses from harming plants. ●Would you put a plant into the demon pot? Contrary to expectations, the demon face bonsai pots are popular among bonsai enthusiasts, especially young or creative people. They look like they enjoy thinking what kind of tree to put into the pot. On the other hand, I heard that some people think the pots are ugly, the faces are too big so that the balance is lost. How about you? Do you like the demon face bonsai pot? 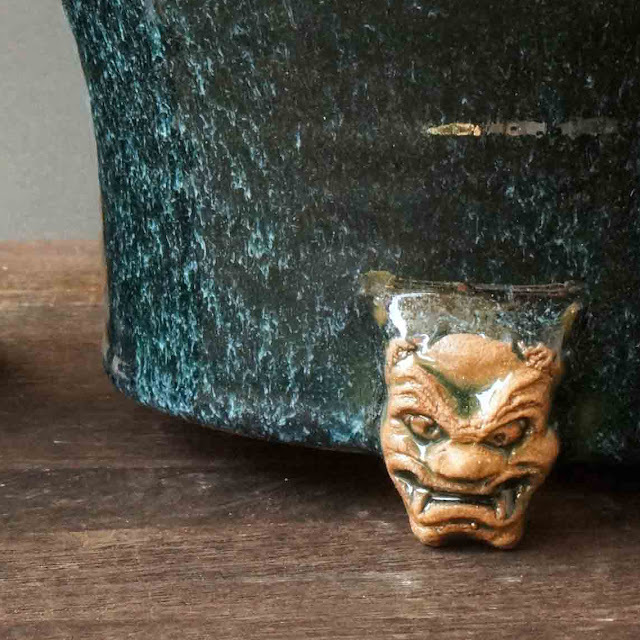 If you are interested in demon face bonsai pots, please have a look here. 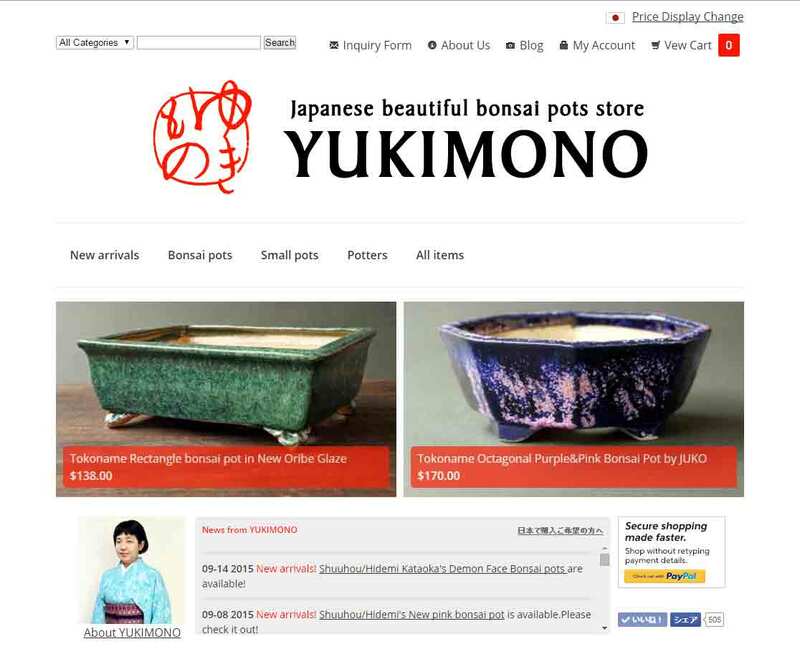 Thank you for reading YUKIMONO blog post.